Giant sequoias don't take root just anywhere. In fact, these majestic trees grow only in 67 isolated groves in the Sierra Nevada—"Goldilocks groves" where soil and climatic conditions are just right. 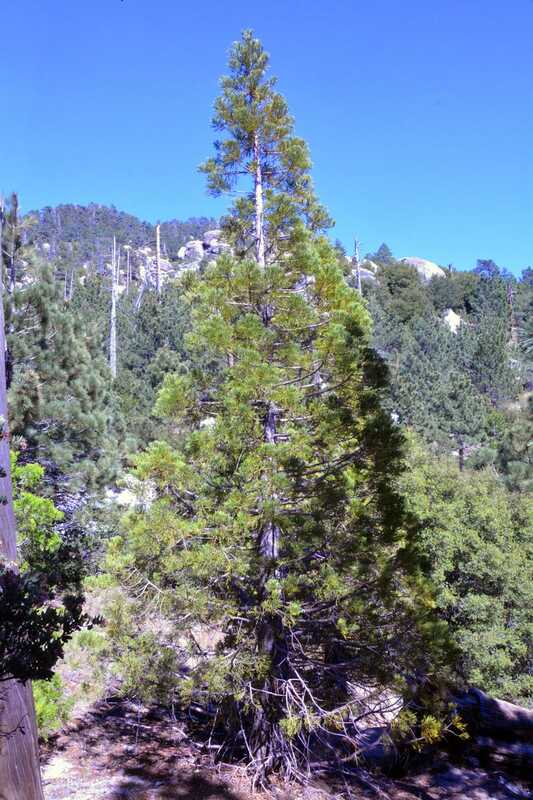 So how can these notoriously picky trees be not only growing but thriving in the San Jacinto Mountains of Southern California, some 175 miles south of their natural range? It was 2008 when botanist Rudolf Schmid and his daughter Mena, a software engineer, first discovered this remarkable stand of giant sequoia in the San Bernardino National Forest. They were hiking up the Black Mountain Trail through Hall Canyon when a strange-looking conifer caught Rudolf's trained eye. As he approached, small, distinctive cones immediately divulged the tree's identity. Schmid knew exactly what he was looking at: Sequoiadendron giganteum. It was a long way from home. Of course, it didn't resemble the "big trees" that come to mind when we think of sequoias—the kind you can drive your car through. Super-specimens like the General Sherman or the Grizzly Giant took thousands of years to attain their record-setting size. No, you'd never call the young trees the Schmids discovered giant sequoias, but even as juveniles these trees stand out with their scaly needles and nearly perfect conical shape. As the Schmids hiked on, they saw more and more of these alien trees, some as tall as 20 feet. "I was shocked," Rudolf Schmid told me in a phone interview. "I did not expect to see such a thick and stately grove of Sequoiadendron" in Southern California. Even more remarkable were the fertile cones hanging from the branches and the tiny seedlings sprouting from the soil. These trees were reproducing without any human invervention. Sequoiadendron had naturalized in Southern California. So how did the trees get there? Back at home, a Google search revealed that the U.S. Forest Service had planted these trees in 1974, soon after a wildfire roared through Hall Canyon and left the landscape barren and denuded. In fact, the Forest Service had reforested mountainsides with Sequoiadendron across Southern California, but this grove was unique. Only here were they reproducing, as far as anyone knows. Rudolf and Mena Schmid returned in 2009 to make detailed observations, Mena plotting the GPS coordinates of 157 individual specimens. The landscape, Rudolf noted, mimicked that of the Sierra Nevada. The trees all grew at an elevation of 6680 to 7336 feet, clinging to northeast-facing slopes. Most importantly, the 1974 fire had bared the San Jacintos' granitic soil, allowing the sequoia seeds to germinate. The Schmids published their findings in a 2012 paper in Aliso: A Journal of Systematic and Evolutionary Botany. Inspired by their discovery, I recently hiked the Black Mountain Trail in the San Bernardino National Forest to see this grove for myself. The path was steep in places, but the reward was plenty: the opportunity to witness California's most celebrated endemic tree—one threatened by climate change and air pollution—establish a foothold in the Southland. I only wish I could travel forward 500 or 1,000 or 2,000 years to see them fulfill their destiny as giants.